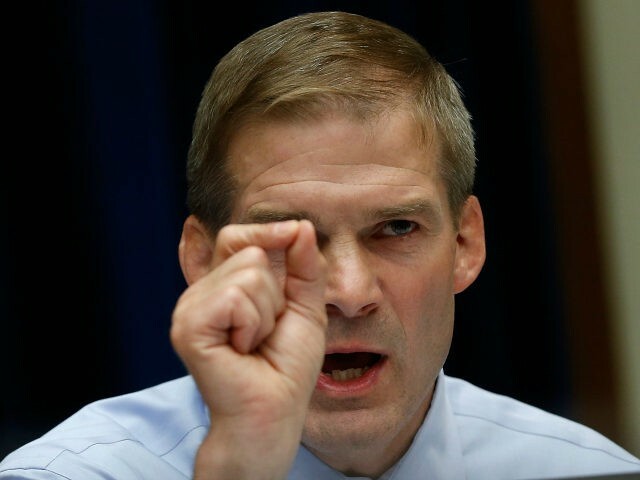 FreedomWorks President Adam Brandon told Breitbart News in an exclusive interview on Monday that Rep. Jim Jordan (R-OH), if he becomes the next speaker of the House, will play a “huge part” in draining the swamp. FreedomWorks, a prominent conservative grassroots group, backed Congressman Jordan in April, a founding member of the House Freedom Caucus, for speaker to replace the outgoing Speaker Paul Ryan. In May, more than 40 prominent conservative leaders sent an open letter to Congressman Jordan, urging the member to declare himself a speaker “at once” to replace Ryan. Jordan told Breitbart News in an interview in late June that he confirmed he will be a “part of that discussion” in the speaker race. Brandon told Breitbart News that a potential Jordan speakership would help drain the swamp, contending that Speaker Jordan would control the legislative process to push bills that better fulfill President Donald Trump’s legislative agenda. The conservative leader noted that Jordan, as speaker, would help return to regular order, which would avoid passing spending bills such as the $1.3 trillion omnibus spending bill signed by Trump in March and pass the rest of Trump’s legislative agenda, such as repealing Obamacare and reforming welfare. The original Obamacare repeal proposal led by the House Republican leadership, known as the American Health Care Act (AHCA), was lambasted by conservatives and populists for not doing enough to repeal Obamacare. Other Republicans complained about Republican leadership bucking the regular order, instead, drafting the bill in secret. Conservatives labeled the bill “RyanCare” and “Obamacare-Lite.” Conservative and moderate Republicans complained that the rank-and-file members had little input in the drafting of the bill, which led to the original AHCA’s defeat in the House last year. A revised AHCA only passed after then-Tuesday Group co-chairman Tom MacArthur (R-NJ) and House Freedom Caucus chairman Mark Meadows (R-NJ) negotiated a more conservative Obamacare repeal bill. Brandon then said that Jordan would put all Obamacare repeal and other high priority legislative items “front and center.” He added that under Speaker Jordan, Republicans would make “tremendous progress” repealing Obamacare. “Your currency in politics these days is authenticity,” Brandon added.